Home New Technology	UNplug Your Refrigerator! This story originally appeared on PlanetSave. Markus Löffler is a software engineer living in Altadena, California. After a recent power outage that caused all the food in the freezer compartment of his refrigerator to spoil, he thought to himself, “There has to be a better way!” And now there is. Löffler put his talents to work and created an inexpensive solar controller that seamless shifts the power supply for one or two critical electrical devices between grid power, solar power, and battery power. He calls his device the UNplug (clever name, Marcus!) and it is the subject right now of a Kickstarter campaign. Marcus will use the funds from that program to put his UNplug into production. Löffler’s micro-solar system requires just one solar panel (you can add more if you wish). He provides a list of components you will need on his website. He even tells you where to go on the web to find them. Rather than adding a full rooftop solar system to your home that can cost $20,000 or more and take decades to pay for, creating a micro-solar system that powers just one or two items costs under $1,000. If your refrigerator uses $25.00 a month of electricity a month, your savings will pay for the system in just 4 years. Instead of spending $7,350 for a Tesla PowerWall (that’s the cost quoted by SolarCity), Löffler relies on two deep cycle lead acid batteries that cost less than $100 each. DC current is DC current. It doesn’t care if it gets stored in a device that pretty enough to hang on the wall of your living room or in a pair of old fashioned marine batteries in the basement. 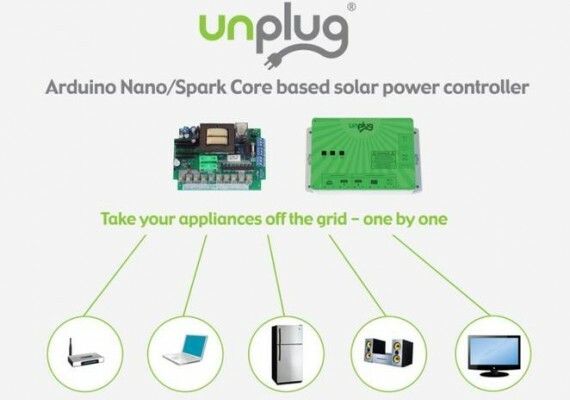 During the day, UNplug feeds electricity from the solar panel into the appliances connected to it and charges the battery bank. When the sun goes down, it seamlessly switches over those devices to using grid power. In the event of a blackout, UNplug then powers those same appliances from the battery bank, allowing certain crucial electricity needs to continue to be met during an outage. The beauty of Löffler’s idea is that you don’t need to begin saving money on electricity while using clean solar power by converting your whole home into an off grid fortress designed to survive a full on zombie attack. You can start small by powering one or two critical items, like your refrigerator. And in a variation of the “If everyone lit just one little candle” theme, if everyone powered their refrigerator with a micro-solar system, that’s a lot of carbon dioxide that never gets put into the atmosphere.